Every now and then a children’s book comes along that sparks our imaginations and puts a smile on our faces and A Lot Of Otters is one of those books. The other day my sister called me to tell me how much she enjoys swimming with her grandson who has autism. She went on to tell me how much he enjoys watching the Otters in the Aquarium of the Pacific (it’s in Long Beach, California our home town) and she wondered if when she is swimming with him in their family pool was he pretending they were otters swimming and playing freely in the water like Otters do? As she was talking to me I started to image the two of them laughing and playing in their pool together like otters do. Later that day while I was shopping in Books A Million I came across a book called A Lot Of Otters. After browsing through it I decided to buy it because it reminded me of the story that my sister told about of Milo liking otters. It turns out that Milo swims like a fish and swimming is one of his favorite things to do and we are hoping that one day he will be able to tell us all about swimming like an Otter. It’s called A Lot of Otters isn’t that a great name? It’s written by author Barbara Helen Berger and in 1997 this book was selected as best children’s book by The School Library Journal. It was also selected for The Prestigious Exhibition The Original Art 1997, Celebrating the Fine Art of Children’s Book Illustrations, sponged by Society of Illustrations, New York. The Author’s Comments: When the toddler climbs into the cardboard box, the blue shadow under the box turns into water, and as he reads his book he sails away. From then on, everything takes place in this fantasy water, made with washes of blue to flow from page to page. The sea otters are based on her careful observations (in two Aquariums, videos and books). So their activities show what sea otters actually do. The way they dive, the way they carry their food, the way they eat, groom, play. However they are playing with stars, and one otter is reading the toddler’s book from the moment he drops it (Oops) to the end. She always likes to have some element in art which is never actually mentioned in the words. That is one of the things about a picture book that can be most magical and fun. 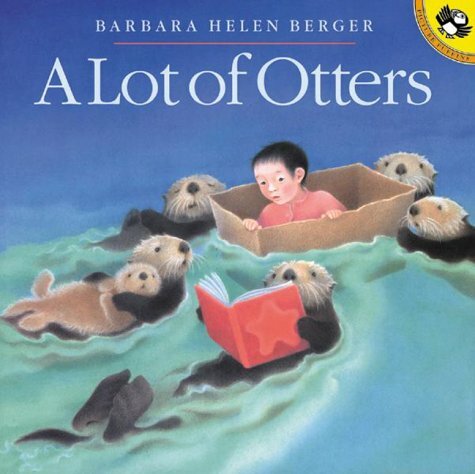 In this case the toddler’s cardboard box and his book with its red cover are never mentioned, nor is the otter who keeps on reading the book whiles everything goes on around him. Take a look at the photo of the cover jacket for “A Lot of Otters.” After looking at it. Who wouldn’t want to be friends with otters? This photo sparks my imagination, and before I know it. I’m pretending that I’m reading a book, while sitting in a card box surrounded by friendly otters. Then I feel carefree like a child again. Honesty what could be more fun than children than pretending they are playing with Otters? Stop reading this for a minute and pretend that you are swimming with a group of fun-loving otters like the ones in this book. Did you really stop? Wasn’t that fun? There is nothing more delightful than watching children while they are swimming except for swimming with them. I wonder if while children are frolicking in the water are they pretending to behave like otters too? They move so carefree the way Otters do? Don’t they? This article is for Trish and Milo because they love to read and look at books about otters and swim together. It seems that Nana’s, Otters, and Swimming are a good combination for some children with autism at least it seems that way for Milo. Some children can tell their parents when they are pretending to be like otters while others can’t because they have autism regardless if a child can speak or not, books can be a powerful influence in a child’s life. It feels good when our imaginations are sparked doesn’t it? Children and books about animals as their friends is magical regardless of what their challenges are. Just ask a grandparent and they’ll tell you all about their favorite childhood books that were full of friendly animal characters. Children’s picture books date back to the seventeenth century, but they really came into their own in the nineteen-twenties. Children’s picture story books like “The Little Red Hen” and “Little Black Sambo ( which would not be considered politically correct today) but were popular in the good old days.